Persuasive and palusible and credible options and solutions exist but Obama, stuck in his radical outlook frame cannot accept them because of how he views the Arabs. The figures he has been given are wrong. His assumptions are incorrect. But, as Dani Dayan pointed out, his references to internal Israel is disturbing (Dani termed it "outrageous"). And his employment of the adjective "aggressive' is outright inimical. As for managing international fallout, Ukraine will permit Obama to exhibit whether Israel can really trust him and his policies and his reactions. On Israel, Obama was harsh and unfriendly to Netanyahu...Under Mr. Obama corruption in the Palestinian Authority has exploded and they have gone five additional years without an election. ...The burden of making peace is put entirely on Israeli shoulders. PA president Abbas (whose term ended five years ago, and who is surrounded by growing corruption) is portrayed as a lovely man ready for peace—no mention that he refused it when it was offered by then-prime minister Olmert in 2008. Is Abbas really ready, now, to sign what he would not back then: an agreement that ends the conflict entirely and finally tells Palestinian “refugees” that they have no right to go to Israel? An agreement that acknowledges Israel as a Jewish state? 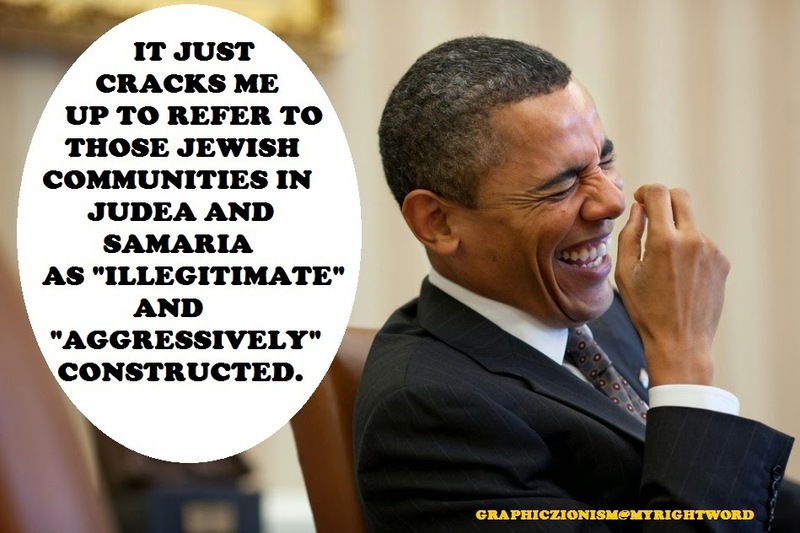 These doubts are never acknowledged by Obama, who assumes that the only problems are on the Israeli side. Then comes the kind of vague threat that Secretary Kerry has also made...As to that “aggressive settlement construction,” it is worth noting that at Obama’s request Netanyahu suspended construction in settlements for ten months in 2009...The political battle over the West Bank would be far greater [than the Gaza Disengagement], so Obama is telling Netanyahu he must risk his own and his party’s future—on faith in both Abbas’s reliability and Mr. Obama’s own. The reason that there is no peace is because the vast majority of the Western world defines the problem incorrectly. ...The idea that Israeli settlements are expanding inexorably is one of the biggest lies of the Middle East, and it is one that even the President of the United States believes. Sure, the Jewish population has been growing, inside Area C, which is allowed under existing agreements signed by both parties. But essentially all that population growth has been accompanied by no growth in area. ...If there was any real indication of good faith on the part of Abbas - if his schools would teach real peace, if his media would stop incitement, if Israeli Jews could trust him enough to believe that when they want to visit holy sites under his control that his own people won't try to kill them - then peace would be at hand. The reason that Israelis don't accept his words is because they see the divergence between what he says in English and how he acts with his people. This is the message that Israeli leaders have been terrible at conveying, possibly because they don't want to insult Abbas when the West loves him so much. But at some point diplomatic niceties need to yield to cold facts, and the reason there is no peace is because everyone is ignoring the facts, and how they fit together. How ironic is it that this interview appears on the weekend that the Presiident is being played the fool by Putin. This interview explains why Putin feels comfortable toying with the leader of the free world, informed as it is by a unique combination of hubris, naïveté, intellectual dishonesty and ignorance. To take two examples: has Abbas really recognized the State of Israel, created by the UN in Resolution 181 to be a Jewish State? Absolutely not. Is Obama's statement to the contrary informed by ignorance or intellectual dishonesty? more Arab-Israelis, not fewer Arab-Israelis, as time goes on. favor, with Palestinian and Israeli Arab fertility rates declining while Jewish rates go up. Even those secular Russian immigrants whose cousins back home barely approached a sustaining fertility rate are having 3 and 4 kids in the Jewish Homeland. And to make matters worse: Israelis are slowly starting to realize that the REAL demographic threat would happen if a Palestinian state were created and it was flooded with millions of Arabs who had someone in their family living for any period of time during the British Mandate. Painfully silly argument: "We do not know what a successor to Abbas will look like." So Israel should cut a deal based on Mahmoud Abbas when there is no telling what kind of radical may take his place? Painfully silly argument: " Do you place restrictions on Arab-Israelis in ways that run counter to Israel’s traditions?" Oops. So is Mr. Obama suggesting that even if we give the Palestinians everything they want that we still stuck with terrible problem posed by the Israeli Arabs?